1.) 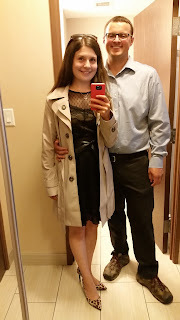 Hubby and I had a quick getaway to the city this week. It was really nice. We enjoyed a night out together, just the two of us. I really enjoyed it! Hubby wants it on the record that he changed his shoes for our night out. They were in the car at the time of this photo. 2.) Miss. E was so excited to see us when we went to pick her up, that she squealed. It was adorable and heart warming. 4.) I watched Gran Torino with Hubby this week. (It was playing on AMC when we were in the city.) I actually really enjoyed it. I am not a Clint Eastwood fan, but this movie was pretty good. 5.) I had the most delicious strawberries and peaches this week. Yummy! I love summer produce! Love your date night outfit, especially with your new leopard heels! So cute! !